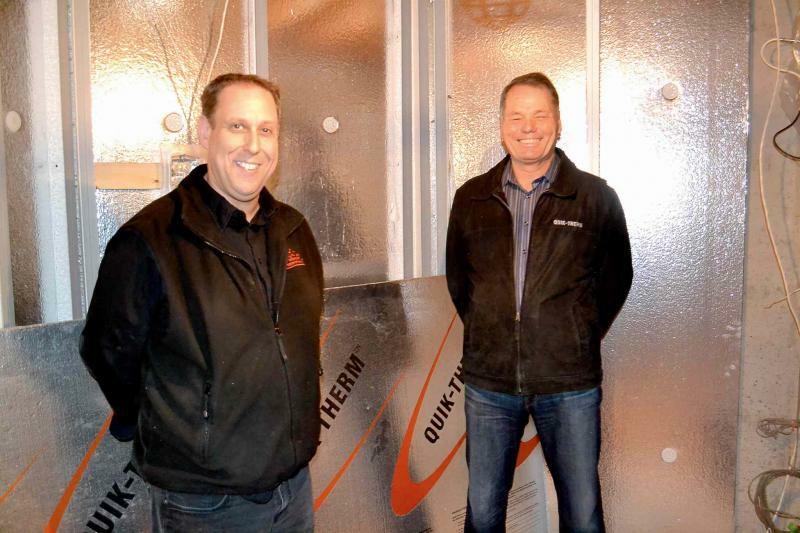 david square / winnipeg free press/Senior project manager Curtis Breslaw of All Canadian Renovations (left) and CIS inventor Ted Cullen of Quik-Therm Insulation Solutions Inc. in the recently insulated basement of a home in the Whyte Ridge area. david square / winnipeg free press/Eric Anderson fills the groove in a CIS panel with low density foam prior to fitting the tongue on the adjacent stud into the groove. A Winnipeg renovation expert has invented an easy to install insulation system that has the potential to capture a large share of the interior basement market. Ted Cullen's Quik-Therm Interior Basement and Concrete Insulation System (CIS) uses high density foam studs that interlock with polystyrene panels to create a wall that acts as an air, vapour, radon and radiant barrier all in one. The easy to assemble system takes approximately 50 per cent less time to install than traditional stud, batt and poly walls. The integrated polymer parts are also much more efficient and lighter to handle than conventional insulating materials. "A friend claimed I invented the system because I'm lazy and don't like to work hard physically," said Cullen, who has been in the construction and renovation business for many years. He said it took about three years to design and develop the recently patented system which is eligible for Manitoba Hydro Power Smart financing and grant programs. The 22-inch wide polystyrene panels are available in two and three-inch thicknesses and eight and 10-foot heights. The panels are covered with a reflective facing that looks like aluminum but is actually a plastic film that bends without cracking or breaking. "It's the same material that Doritos uses for its chip bags, so it is perfectly safe to install in the home environment," said Cullen, adding that the mirror-like finish reflects radiant heat back into the basement. The panels and the studs are connected to each other by a tongue and groove joint. The tongue is on both sides of each stud and the groove is cut into the long edges of each panel. The material can be trimmed to length with a handsaw, builder's saw or a serrated breadknife. Cullen said the bottom edges of the studs and panels rest on a foam gasket (sold in rolls), that has sufficient elasticity to compress and maintain a tight seal if the basement floor shifts. He also said CIS walls will not force a main floor to rise if there is minimal upheaval in the perimeter of a basement floor. To create a sealed panel that runs from the floor gasket to the bottom of the ceiling joists, two studs and a panel are cut to height and a bead of low density foam is sprayed into both grooves of the panel. Studs are added to either side by fitting the tongues into the panel's grooves. The completed panel can be fastened to the wall with a construction adhesive such as PL300 or concrete nails with homemade washers to prevent them from being driven through the polystyrene. Renovators or DIYers who own hammer drills can save time by drilling a hole through the middle of the panel, about two feet from the top and bottom, and an inch into the concrete wall. Three-inch or four-inch concrete anchors, depending on the thickness of the panel, are tapped into each hole to secure it to the wall. The high density foam studs and corner posts stop heat transfer through framing members, a difficulty encountered in wood and to a greater extent in steel framed walls. "Heat transfer or thermal bridging through studs results in air leakage, moisture, inferior comfort and high energy bills," said Cullen, who had a thermal imaging expert take shots of the same basement wall, one part covered with wood studs, R-20 batts and 6-mm poly, the other covered with 2-inch thick Quik-Therm CIS. He said the images showed that the wood studs were responsible for a large percentage of heat transfer, resulting in cold areas in the wall where condensed moisture could trigger the growth of mould. Also, the lower area of the wood-framed wall section was colder than the upper areas, creating an uncomfortable heat gradient that caused cold air to gather at floor level and warm air to rise to the basement's ceiling, resulting in an uncomfortable environment. By contrast, Cullen said images of the CIS insulated wall indicated overall warmth from top to bottom, with the foam studs being slightly warmer than the insulation itself. Rim joist cavities, difficult to seal with batt-type insulation, can be made air-tight by friction fitting scrap pieces of CIS panels into the spaces and then running a bead of low density spray foam around the perimeter of the scraps, said Cullen, who estimates that the cost to fill each cavity with spray foam would be in the many hundreds of dollars. Like most forms of insulation, CIS must be covered with a fire-retardant material such as half-inch drywall, which also protects wiring from mechanical damage. "If you touch the drywall in a basement that has been sealed with CIS, it will feel warm to your hand no matter where you touch it. In most cases homeowners are able to close down the heat ducts going into their basement," said Cullen. Drywall is attached to the 24-inch polymer studs with standard drywall screws. 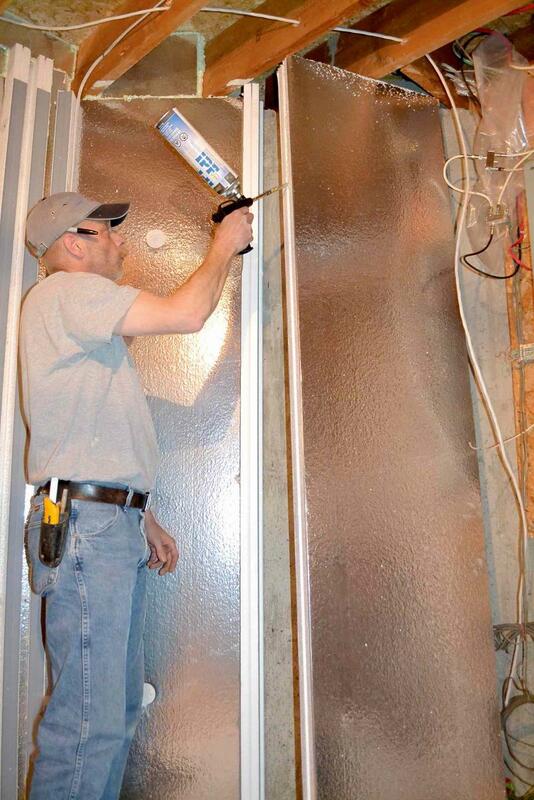 During the three years it took Cullen to have his CIS insulation approved to meet new Canadian building codes, it underwent thermal performance testing to determine its actual effective R-value. According to the National Research Council of Canada (NRC), "the focus of building code and regulatory officials, professionals and researchers has shifted towards the performance of the entire wall system." The NRC therefore concludes that "it is not sufficient to characterize the wall by its R-value alone, as was the case in the past." Research by the American Society of Heating, Refrigeration and Air-Conditioning Engineers (ASHRAE), indicated that "the effective R-value of 16-inch on-centre wood frame walls insulated with R-19 fibreglass is R-15.8 or less. Steel stud walls insulated the same way have an effective R-value of R-7." Cullen said a certified laboratory used a stringent standard test method to determine the effective or steady state R-value of two-inch and three-inch CIS. "Architectural Testing Inc. found that two-inch CIS placed over a 3.5-inch concrete wall and covered with half-inch drywall had an effective R-value of 17.2; three inch CIS was rated at R-25.5," said Cullen. "This means that the cost savings in energy in CIS insulated basements could be greater than the payments on a Hydro loan," he said. Environmental pros for the product are no ozone depleting off-gasses, panels contain as much as 15 per cent recycled expanded polystyrene, plastic T-studs contain 100 per cent recycled plastics, and packing made of up to 80 per cent recycled cardboard. "CIS has no formaldehyde or no glass fibres, no odours, and will not promote mildew or mold, and it does not absorb moisture, thereby reducing damage and expense caused by basement flooding," said Cullen. Brock White is the main distributor of CIS in Winnipeg; further information is available on Cullen's website at www.quiktherm.com.